NASA's OSIRIS-REx met Bennu on Monday after a two-year journey that covered over two billion kilometres. NASA's first attempt at landing on an asteroid and retrieving a sample has now arrived at its destination. The spacecraft executed a manoeuvre that transitioned it from flying toward Bennu to operating around the asteroid. "As explorers, we at NASA have never shied away from the most extreme challenges in the solar system in our quest for knowledge," said Lori Glaze, Acting Director for NASA's Planetary Science Division. "Now we're at it again, working with our partners in the US and Canada to accomplish the Herculean task of bringing back to Earth a piece of the early solar system," Glaze said. Now, at about 19 kilometres from Bennu's Sun-facing surface, OSIRIS-REx will first begin a preliminary survey of the asteroid, NASA said. The spacecraft will commence flyovers of Bennu's north pole, equatorial region, and south pole, getting as close as nearly seven kilometres above Bennu during each flyover. 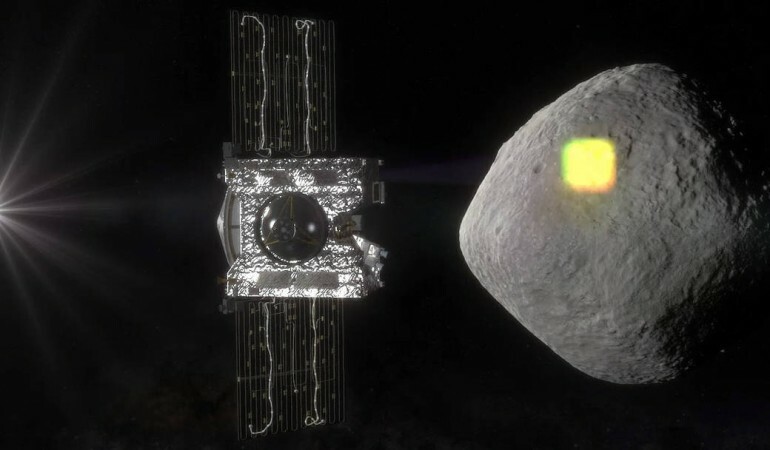 OSIRIS-REx's mission will help scientists investigate how planets formed and how life began, as well as improve our understanding of asteroids that could impact Earth. The spacecraft will enter orbit around Bennu on December 31 - thus making Bennu, which is only about 492 metres across -- or about the length of five football fields -- the smallest object ever orbited by a spacecraft. It is a critical step in OSIRIS-REx's years-long quest to collect and eventually deliver at least 60 gram of regolith -- dirt and rocks -- from Bennu to Earth. Bennu is now about 122 million kilometres from Earth. This near-Earth asteroid was chosen for study as it orbits around the Sun every 1.2 years and comes very close to Earth every six years, thereby throwing a probability of colliding with Earth in the late 22nd century. The arrival came after Japan's asteroid explorer Hayabusa2, launched in 2014, released two small robotic rovers on the asteroid Ryugu in September.